In terms of a royal occasion, they don’t come any more special than a day like this, the wedding of a senior member of the royal family, the eldest son of the Prince of Wales and the immensely popular and still missed Princess Diana. He is Prince William, second in line to the British throne, extremely popular with the British people in his own right and his bride-to-be is his 29 year old fiancée Miss Catherine Middleton, long-time girlfriend and former university classmate. An almost ten year courtship came to a culmination on the 29th April when the couple was married in Westminster Abbey. With the Prince and newly created Princess beginning their lives together and barring any unforeseen circumstance, they will one day become King William V and Queen Catherine of Great Britain. On the occasion of their wedding the two are thoughtfully portrayed on the latest commemorative crown struck by the Royal Mint. Only the second coin of its kind, the first wedding commemorative was struck in 1981 for Prince William’s parents and it was an extremely popular coin with more than 26 million of the cupro-nickel examples having been produced. 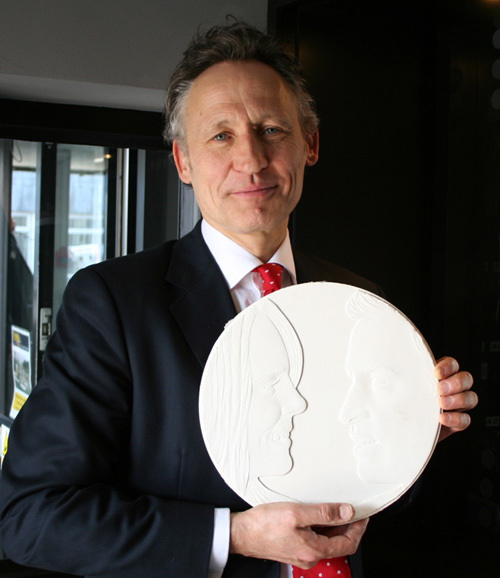 This time, the non-precious metal coins will number only 250,000 and the style of the design is significantly different from the conjoined profile portraits of Prince Charles and Lady Diana Spencer. Mark Richards, a Fellow of the Royal Society of British Sculptors specializing in life size and over life size sculptures rather than coinage has presented us with an intimate depiction of William and Catherine and approached the task of coin design from his own unique take on the project. Having attended the first strike ceremonies at the Royal Mint, we toured the production premises and Mark was invited to strike a silver crown himself. It is the first time he sees firsthand, the proof version of his work and he seems quite pleased indeed with his design. The legacy of this coin is that it has recorded the marriage of these two people who may someday play a significant part on the world stage as King & Queen of Great Britain. But, for now, they’re like any other newly-wed couple and beginning another chapter of their lives together. First, congratulations on your design having been chosen for such an auspicious event here in the UK, it really is a beautiful design, it makes quite a first impression, so I’m going to ask you what was your first thought when you read the brief for the outline of this coin? I try to keep a very open mind by looking at various photos and film footage and generally form an idea or build an impression. Then, I go for a walk… by walking, the idea starts to formulate and from that I begin the initial sketches, it’s my approach to everything I do. Someone once said “the intellect is the enemy of creativity” but that’s the part which you use to research a subject and gather information. The walking is an important way of letting the images pop into my head naturally. 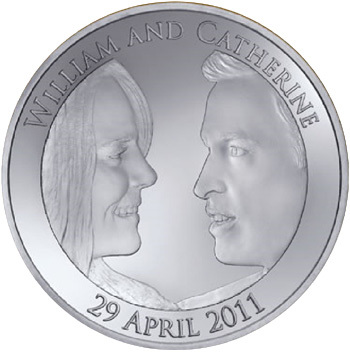 The coin’s design looks as though we’re looking at William & Catherine through a camera lens or porthole, what was your inspiration for this concept or look and was there any symbolism behind this? That’s a really good question, I wouldn’t say “symbolism” because I don’t operate in that way… There are two reasons why the coin looks the way it does. It’s really a close-up portrait of them which is a very important part of demonstrating the intimacy of them as a couple. By positioning them in this way, I could capture their expressions and features. If I had chosen to create the design with two full heads, they would be very small and in the middle with space underneath. So, the impression that you are seeing them through a porthole or lens was an unintended consequence due to my aim of trying to capturing a real sense of intimacy which gives the impression of the viewer being quite close to them. The last significant royal wedding in the UK for Prince William’s parents Prince Charles and Lady Diana Spencer in 1981, an amazing crown coin was struck. Do you remember this coin and if so, did you gain any inspiration or direction from this design which is now 30 years old? You’ve spoken about detail. From your standpoint, what were the challenges to putting together this coin, it’s been said that although Catherine Middleton is quite stunning, it’s difficult to capture her image accurately for some reason, did you encounter this? It is always a challenge to capture a true likeness on such a small space as a coin, whatever the subject. She is fantastically beautiful and he’s a good looking chap as well. But the thing is, her smile is so radiant and when she’s in repose, she can look as serious as the rest of us. When I was looking at images of her I thought “you’re beautiful, you just glow” and she has a fairytale quality which is one of the reasons why I think this story has attracted so much attention. Her quality of beauty is both demure and reserved and also, she radiates a sense of “I’m alive!” which is why I chose the pose that you see. Is it the same kind of challenge which you face when you’re portraying real persons versus historical figures from your standpoint? I do know what you mean, but I don’t experience it that way, I experience every portrait as an image and a feeling that you unlock, from them. For example, if I were to portray King Alfred, I wouldn’t look at any other portraits of him as there aren’t any true renditions to begin with so it would be more about an idea of him as a historical figure. When you are creating a portrait of someone living, there is an added excitement because they can often change the way that people perceive them. 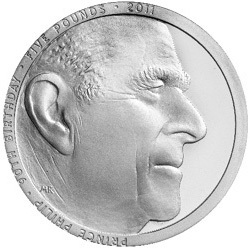 Aside from this coin design which brings us here to the Royal Mint today, and the excellent commemorative coin for Prince Philip’s 90th birthday this year, Can you tell our readers what projects you’re working on now that this is finished? Matt Dent, who designed the present UK circulation coinage introduced in 2008, that was his first coin project and he’s now designed others including the latest 50 pence World Wildlife Fund anniversary coin, might you be interested in pursuing more numismatic projects now? I’m really interested, I was only approached last year for the wedding commemorative coin, and it has been a very interesting and enjoyable process. It’s like any genre, you have to get to know it, understand it and the first two coins did take me a long time to get them right. I’m very passionate about excellence in portraiture and I think the Royal Mint is probably the only institution in this country which is really striving for a sense of excellence with the kind of portraiture that I do. Coins provide an arena to explore portraits on another level. The William & Catherine wedding coin will now enter the chronicles of British numismatic history, how would you like the coin to be described or remembered in the future, what description or key words would you be satisfied with? I’d like it to be described as being an intimate, sensitive portrait of the royal couple, that isn’t in the classical tradition of portraiture but is a contemporary image that hasn’t de-valued the currency of relief portraiture in coinage… to coin a phrase! I often end my discussions by asking those I have the opportunity to speak with, if they collect coins themselves so, I’m going to take the chance and ask this of you, do you collect? Thank you very much, it’s been my pleasure as well.